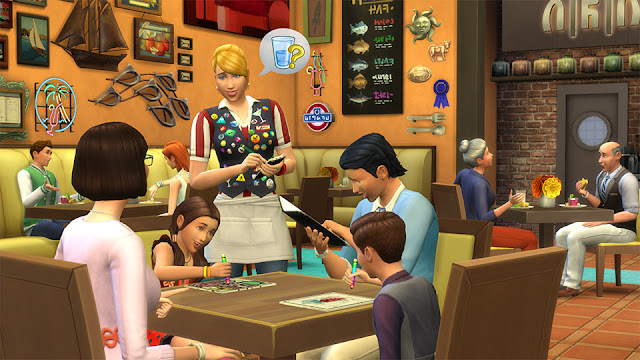 The Sims 4 Dine Out: New Screenshot! Hi Simmers! 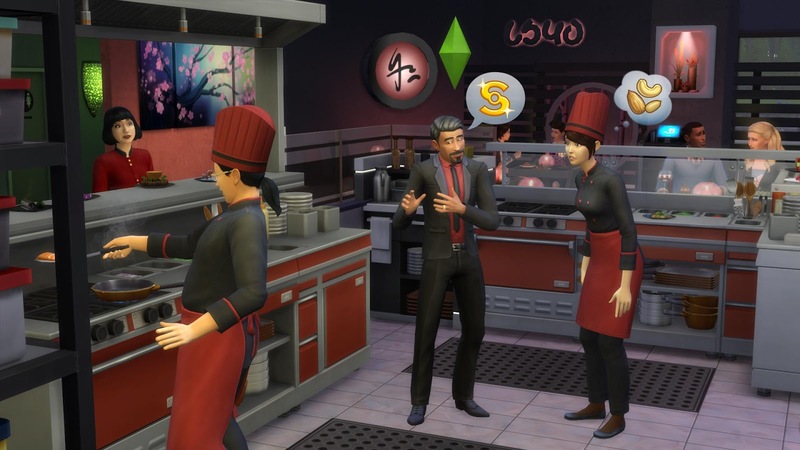 The Sims 4 Dine Out Game Pack* is coming on June 7, and includes the ability for your Sims to go out to eat, and own and run their own restaurant. But that's not all that's on the menu. Today we wanted to talk about some of the new dishes so that we can fully savor the flavor and whet all our appetites for this fantastic game pack. Tired of the food metaphors? Strap in, it’s going to get worse. The Sims 4 already has a wide variety of recipes, running the gamut from real-world favorites to Sims classics. We were eager to experiment in a more ambitious culinary realm, so we set them loose to create a huge array of high concept, bizarre, tantalizing, Experimental Food. The goal behind the experimental food is to wow your Sims. We wanted to create beautiful, avant-garde dishes that seem like they come from a celebrity chef on an amazing cable TV show. The dishes are bright, bold, and beautiful, and full of life with amazing new animations that you might not expect to see on a platter. The flowing lava on the Volcano Pasta is gorgeous and amazing. The Jungle Moss Egg with Lavender Wisps looks like something from an alien world. And the savory Bacon Love Petals look like a dish that I’d gladly spend $19.99 on at a high end restaurant. The food isn’t just a culinary feast for the eyes and the imagination. 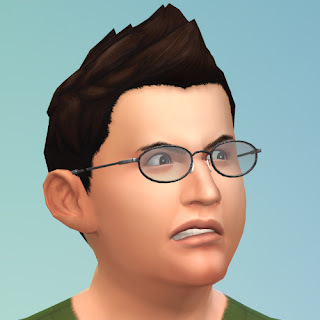 Your Sims will benefit from a slew of powerful and fascinating Moodlets that will represent exactly how your Sims feel about the flavors bombarding their digital palates. If you want, your Sims even have new social options to discuss their food. We always try to make our game current with real world trends, and The Sims 4 Dine Out is no exception. Your Sims can eagerly photograph their meals. But, to take it a step further, all of these will turn into beautiful photographs for your Sim’s walls, or even their own restaurants! Your Sims can challenge themselves to complete the Experimental Food collection, which gives them a reason to try every dish in town. We’re a bit hungry from all this food talk, so we’ll leave you here and find something to eat. Perhaps we’ll snack on Cubed Ahi with Veggie Wasabi Matrix? Yum! 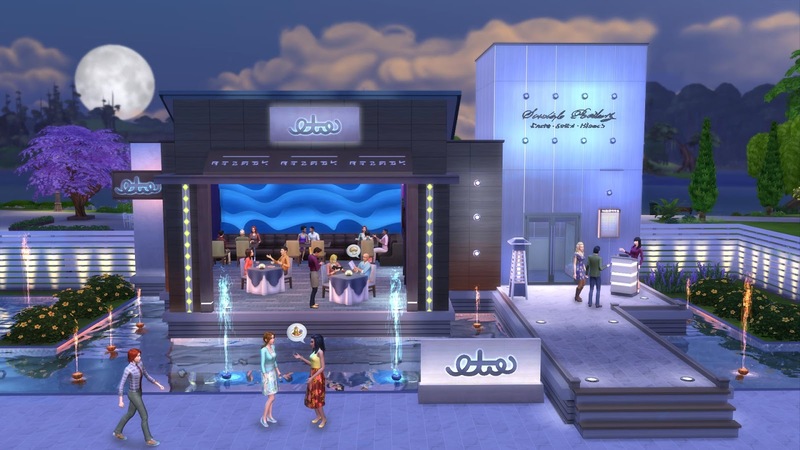 The Sims 4 Dine Out Game Pack will be released on June 7, but there's still plenty to talk about. The burners are barely lit for what we have to show you. And no, the food puns will never stop. We addressed an issue where the Tragic Clown hair was randomly appearing on townies who were not the Tragic Clown. As much as we love this hair, it is a bit of an oddity to see haphazardly on Bob or Jane the neighbor as they jog on by. The Tragic Clown hair will no longer randomly appear on your friends and neighbors… unless you want it to. Several interactions on the computer for children now properly display a skill icon to communicate why the interaction is present (unlocked because of a skill), or what the interaction will benefit for your child (raise a skill when performed). Children will now gain social motive when an adult reads to them. “Just one more” interaction is only present in the IRL version. Chatting with Sims on the Slablet will now build relationship with that Sim. …because all Sims are Sims. As the song says “Sims are Sims so why should it be, that those Sims should have gotten along so awfully…” on the Slablet. Ok, so maybe that wasn’t exactly the song’s lyrics, BUT if the writer had known about the Slablet, I’m sure it would have changed everything… a whole new mode. Masterbedroom will no longer be blocked by the profanity filter when sharing to the Gallery. Addressed an issue that could cause a Sims shadow to flicker when in a low light room. 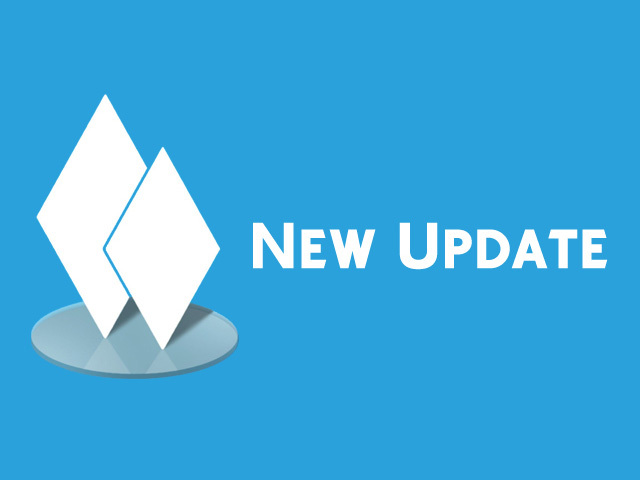 Added a blank line between each release note, in order to elongate the visual impact of the release notes. Napping in a hot tub will now properly trigger Ultra Speed. Napping in a hot tub is not recommended because you know… water. We addressed an issue preventing the completion of the Be Parent to a Child with 3 Friends aspiration goal. Edge scrolling now functions in windowed full screen mode. You can find the option to turn on or off Edge Scrolling in the Options Menu (ESC) under the Game Options / Game Camera tab. We fixed an issue where photographs placed on a lot could incorrectly flag the lot as having CC when shared to the Gallery. This will correct the issue for creations going forward. Ending a sentence with a preposition is bad, according to my 4th grade teacher, about from except with upon toward among. We hope you have a full appetite and a craving for creative cuisine, because we’re taking everyone out for dinner. That’s right! 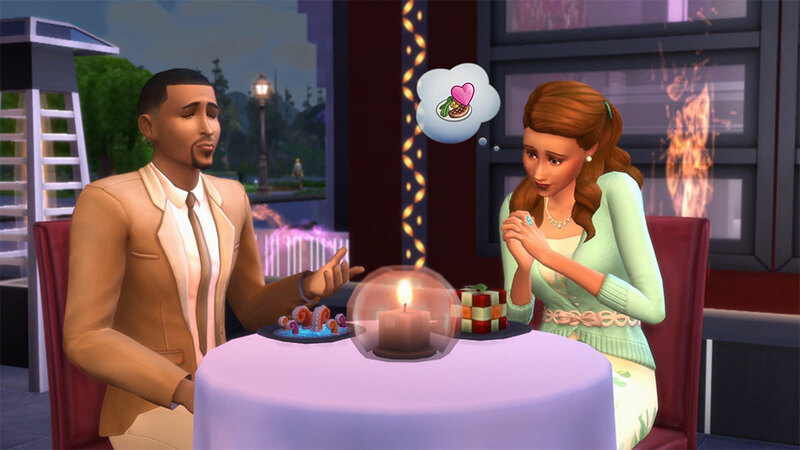 Today, we’re announcing The Sims 4 Dine Out Game Pack*! This is a game pack we've wanted to make for a long time, and based on your forum, Twitter, Instagram, Facebook, and carrier pigeon comments, we know many of you are as excited to try it as we were to make it. 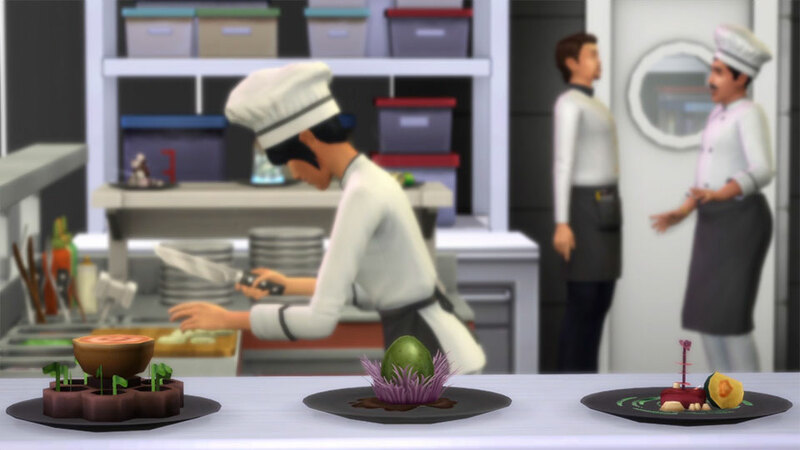 In The Sims 4 Dine Out, you’ll not only be able to take your Sims on delicious trips to beautiful pre-made restaurants, you can get creative and customize your own. But, why stop there? The Sims 4 Dine Out lets you build, own, and run a restaurant, which means it’s time for your entrepreneurial Sims to jump out of the fire of their normal day-to-day job and into the frying pan of the kitchen. We make no excuses for our metaphors! 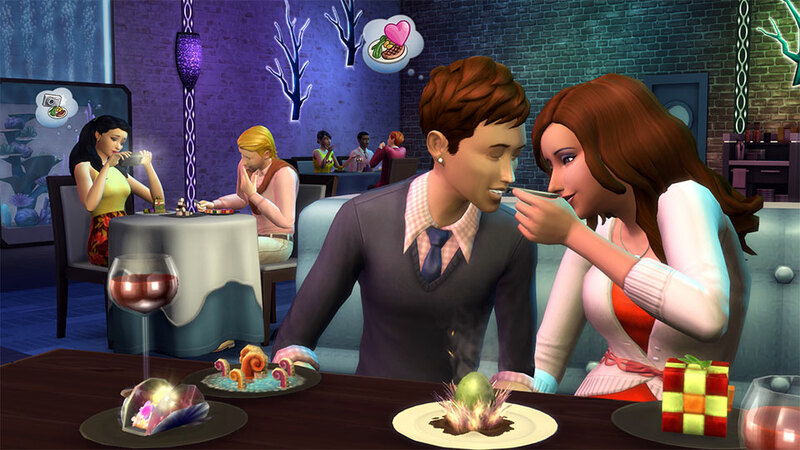 The Sims 4 Dine Out is full of new experiences, like experimental food, clumsy waiters, and so much more. But, we’re getting ahead of ourselves. We will dive deep into how the sausage is made in the very near future, so keep a close eye on our social channels and website to find out more in the coming weeks. Hungry for more? 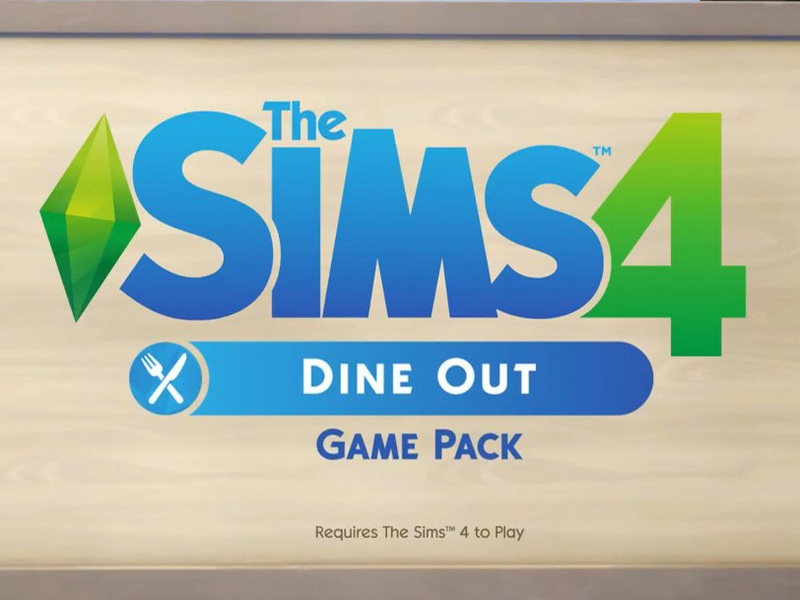 Don't worry, you won't need to wait long to dig in – The Sims 4 Dine Out Game Pack will be released on June 7! Want to know more about the fine people working on The Sims 4? Good news! We’re starting up a new series: SimGuru Spotlights, where we talk to a different member of The Sims Studio and ask them to answer questions about their life, their passions, and, most importantly, their favorite ice cream flavor. Can you give a brief introduction to yourself? 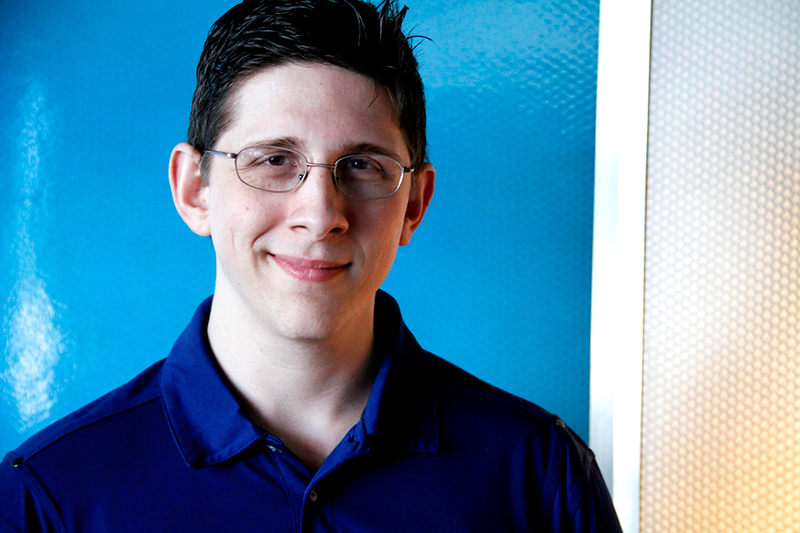 Hey, I’m Graham Nardone – one of the producers working in The Sims Studio. You might also know me as @SimGuruGraham on Twitter or our forums, where I frequently shoot the breeze with other Sims fans. I’ve been working on The Sims for going on 7 years now, which is always easy to remember as my hire date was the exact same day that The Sims 3 launched. Before arriving at EA I broke into the video game industry as a QA tester on a number of action games and third-person shooters. Some people find that sort of gaming background an odd juxtaposition to The Sims, but I think everyone in our studio brings their own unique identity and interests, and that’s part of what makes The Sims such a rich life simulation. What do you do on The Sims 4? As a producer I’m fortunate enough to do a little bit of everything, and that’s exactly the way I like it. Each day brings new challenges, new people from different disciplines to work with, and there’s always an opportunity to learn and grow within the role. As a jack of all trades, it’s important that producers get out amongst the team and communicate with everyone that’s working on one of our features. The more I understand the challenges they face, the better equipped I am to make decisions that impact the final product that players get their hands on. Currently I’m focused on the Stuff Pack line of content that we release for The Sims 4, which I’ve really grown to love working on. Because stuff packs are smaller chunks of content, we rapidly go through production cycles, always have something new and interesting to work on, and get to immediately apply whatever we’ve learned to the next thing. From the initial design brainstorms to nailing down the final bug before we ship, I’m involved with it all. What’s the best thing about being a SimGuru? As someone who hasn’t had too many opportunities to travel outside of North America, being a SimGuru has opened doors to traveling all around the world. It’s wonderful to meet with The Sims fans and press, and to be entrusted with representing the hard work of everyone back at the studio. That last part in particular is so important to me, because too often in video games fans attribute success to a single person, when there’s an amazing team of developers that the game couldn’t exist without. As much fun as I have on producer tours, I’m also fortunate to get first-hand exposure to The Sims fans who take the time to share their feelings about what we’re creating. I perceive one of my roles as being an internal mouth piece for the community, and I’m always vocal to help represent fan’s opinions in group discussions in the studio. When I think back on these trips though, I’m primarily left with so many wonderful memories… be it presenting on a gigantic stage at Gamescom in front of tens of thousands of people, being taken to a fancy ice cream shop in France, or participating in a photo shoot with a dingo in Australia… they’re all great experiences that I remember fondly. What do you love most about The Sims franchise? As a teen I spent a lot of time fiddling with level editing tools in various video games. I’d always considered it a hobby that I loved, and had hoped to even do it professionally one day. I ended up following a different path while finishing my education, but the curiosity to explore those tools and just build play spaces that spring from your imagination was always alluring. As such, Build Mode in The Sims was a natural fit for me to gravitate towards. To this day it’s my favorite aspect of the game, and I love seeing what players create with it as well. One of my proudest moments working on The Sims was building a number of the tombs that came with The Sims 3 World Adventures, essentially fulfilling a childhood dream to create gameplay environments in a professional game. The Sims players always manage to one up us though, and there’s no better example than all the over-the-top houseboats that players dreamed up when The Sims 3 Island Paradise was released. I don’t particularly have a favorite flavor, I find I often select one on a whim. That said, I have to give it up to Chocolate Caramel Gelato. It’s one of the very few flavors you can find in stores that simply combines caramel with chocolate… which is far superior to the more common caramel and vanilla pairing.